The Arcimoto SRK electric trike might just be the Holy Grail of motorised personal transport. Short enough to park to like a motorcycle, but boasting a roof and seat belts like a car, the lightweight electric trike can squeeze up to 130 miles out of a single charge. With an estimated 230 MPGe, the trike nevertheless manages 0-60 in 7.5 seconds and is capable of a top speed of 85 MPH. If you’re a car driver worried about the missing wheel, fear not – the reverse trike configuration, dual motor front-wheel drive and battery position make for stable and predictable handling. The Arcimotor SRK shares a trick with the Smart car; it’s just short enough to squeeze into the tightest parking spaces nose-in to the curb like a motorbike. 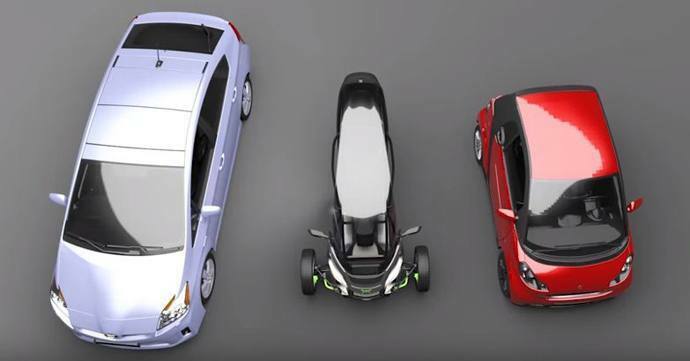 Toyota Prius vs Arcimoto vs Smart car – which one would you choose? With urban populations on the increase, commuters who prefer the freedom of personal transport will have to take a more flexible approach to the type of vehicle they choose. Congestion charging, restricted parking, traffic jams and increasing fuel costs have already pushed many towards two wheels, but there’s little doubt that rider safety dissuades many from commuting by scooter or motorcycle. The Arcimoto SRK electric trike might not be able to filter like a two-wheeler, but it will reassure nervous commuters with its full roll cage, race harness seat belts for both occupants and crumple zones front and rear. Prices for the Arcimoto starts at £7,800. If you think congestion is bad today, consider that population growth and increasing urbanisation is expected to see an additional 2.5 billion people living in cities by 2050, according to a United Nations report published last year. For those unable or unwilling to cycle, the future may hold travel by networked electric vehicles; autonomous pods that can be hailed like a cab and bridge the gap between public and private transport. 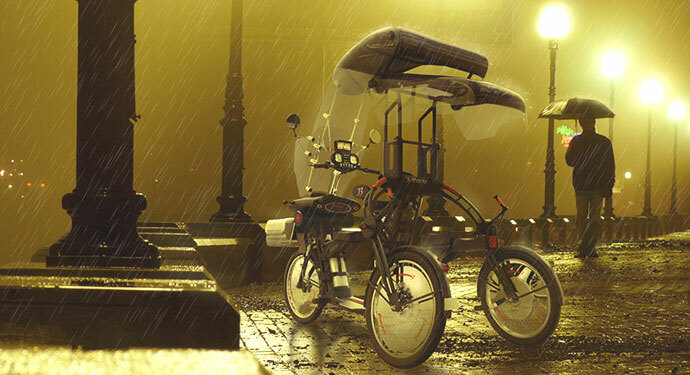 However, a Dutch company believes the answer to personal and light commercial transport in our evermore crowded cities is the Johanson3: a contemporary take on the rickshaw. The Johanson3 is a simple approach to personal mobility for short and mid-range distances. It provides a stable platform for carrying goods or passengers and because the rider stands rather than sits, the design accommodates people of all ages with a height from 1m to 1.95m. Conventional trikes can feel very awkward when cornering, but the johnson3 tilts like a bicycle. Cycle insurance from the ETA covers electric bikes and trikes up to 250W against theft (including battery), accidental damage as standard. It also includes third party cover and cycle breakdown. 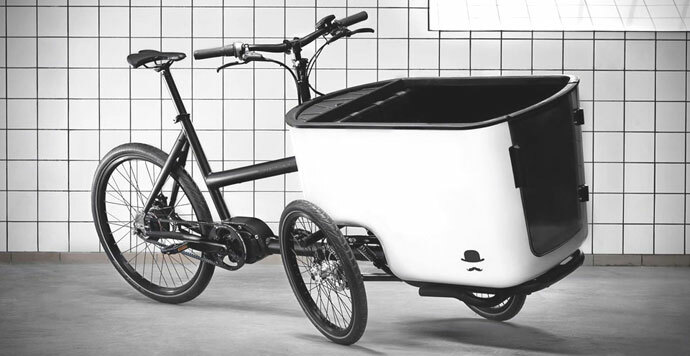 Butchers & Bicycles based in the meatpacking district of Copenhagen (hence the name) has recently started selling the MK1 – a leaning cargo trike designed to retain the performance and fun of a conventional bike. British city cyclists regularly reach their destination quicker than any other mode of transport, and yet, for the most part, rarelt venture beyond road bikes and MTBs. Elsewhere in Europe, the bicycle is considered a practical alternative to the car and certain designs have evolved to carry loads of up to 250 kg. Such cargo bikes tend to be big, heavy and relatively slow, but the MK1 aims to challenge the perception of how fun and easy riding a cargo bike can be without compromising usability. Christiania cargo trikes are being bought in increasing numbers in London, not only by businesses looking for an environmentally-friendly way of bypassing the congestion charge, but by parents looking for a practical and fun alternative to the car for the school run. When it comes to transporting young children by bike, especially on the school run, there are various options to choose between. By far the simplest and most popular is the child seat fitted onto the rear rack, but on a standard bike it is not possible to carry more than one child in this way. In Denmark , particularly in Copenhagen, a significant majority of families with two or more kids cycle their little ones around in a very interesting looking tricycle called a Christiania. There is a choice between a standard-sized model, which can fit two to three kids, and a longer version, which could fit four very comfortably, and even up to six. The box where the kids sit is in front, so both the parents and the kids get the advantage of a good view, while the parent can also keep an eye on the kids while safely manoeuvring them about. The alternative option – of a trailer that attaches to a normal bike – isn’t as comfortable or fun for the kids as they mainly see the cyclist’s bottom in front of them. The Christiania tricycle also has the great advantage over a child seat that there is loads of space for all kinds of shopping, even when fully loaded with kids. In fact, the space is comparable to the boot space in a small family car. Established over 25 years ago, and with over 5,000 recovery trucks on call 24/7, we have a proven track record of providing efficient, reliable breakdown cover. We have been voted Britain’s most ethical insurance company by the Good Shopping Guide. Your emails are always very interesting, but this one with the amazing cycle light and the electric trike is the best yet! Goats have kids, people have children. The article seems to have been written by somebody who is only semi-literate. Can I drive this without a driving license? when and where can we buy one in uk ? always seeing fun vehicles and affordable , but only on here ?